SERPed.net can even help you with client acquisition! Our suite of SEO tools indeed comes with the insanely powerful 'Site Auditor Pro', which is a tool that allows you to create audit forms that you can embed anywhere you want and provide users with detailed SEO reports. In other words, it's a client lead magnet that will bring in new business for your SEO company. Do you know how much our competitors charge for this kind of tool? Between $50 and $200 per month. Well, you can go with any of them and pay up $2,400 per year for this kind of tool, or you can decide to go with us and have this tool included in your SERPed.net membership, at no extra cost! 'Site Auditor Pro' is the most powerful, most flexible SEO audit tool on the market. Period.With 'Site Auditor Pro', you can customize your reports, with your logo and contact details, as well as your audit forms and emails. 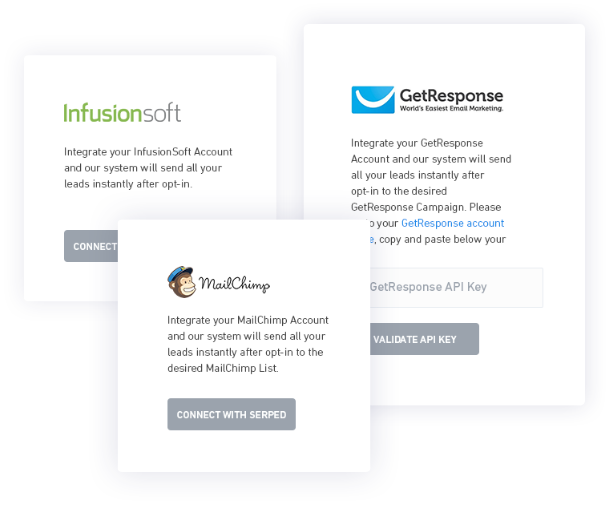 All your leads will be saved for you, but you can also add your autoresponder details, so they are automatically sent to your autoresponder system. 'Site Auditor Pro' integrates with AWeber, MailChimp, GetResponse, Ontraport, SendReach and Infusionsoft.